Have you experienced the frustration of transporting food only to reach your destination to find that it has spoilt from inadequate packaging? Whether it’s frozen leafy greens or inadequately cooled meats, it can be expensive, frustrating, and potentially harmful. Don’t take chances with your products in shipping or storage, cool them with frozen gel packs for a consistent cooling solution. 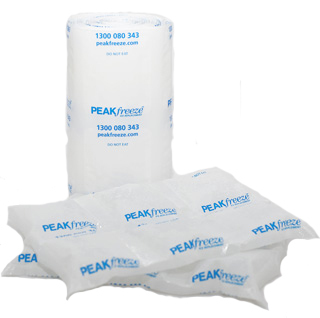 Our gel ice packs come un-hydrated for cost effective transportation and storage. To use, simply soak in water and freeze as required. 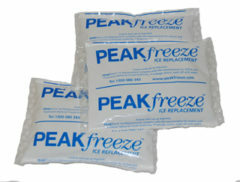 Peakfreeze is your mess-free, cost-effective solution to food transportation. No more water spillage, no more spoilt food upon arrival. Our excellent ‘freezing duration’ factor ensures that your packages will stay frozen for much longer than classic ice. Whether it’s commercial seafood, pharmaceuticals, injury ice pack or the home ice box, Peakfreeze is the solution for consistent temperature control. 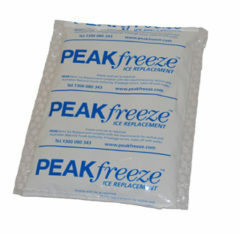 When packaged properly, Peakfreeze is a much more economical and vastly superior solution to conventional ice. We also sell a wide variety of packaging solutions for business and private use, from carry bags to carton liners, we provide you with high-quality reliable products at unbeatable prices. Peak Packaging might be the fresh face of the packaging industry, but our cutting-edge solutions made with innovative minds and quality materials are already making a splash. Don’t spend more than you need to, don’t waste any more produce and products through inadequate cooling. Choose us as your suppliers of dry ice, gel freezer packs for food shipping, cold packs, and other frozen gel pads. Ice turns to water, but our ice replacement pads for shipping and storage stay solid to keep your items cooler for longer. Buy your dry ice, frozen gel packs, gel freezer pads and all other ice replacement solutions today from your trusted storage and shipping solution supplier. For any questions or enquiries, don’t hesitate to contact our friendly team on 1300 080 343 or by email at info@peakpackaging.com.au.